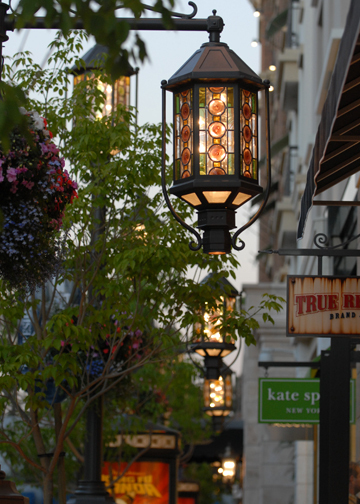 Americana at Brand Case Study | ELA Lighting, Inc.
Environmental Lighting for Architecture produces greatness for an ‘Americana' retail and residental lifestyle center. 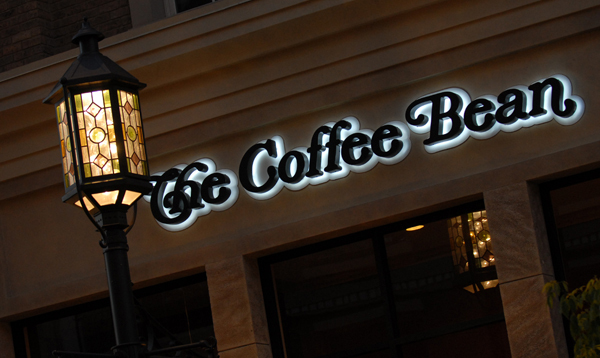 ELA was commisioned by Americana developer, Caruso Affiliated, to design and manufacture a series of custom luminaires to enrich The Americana at Brand experience. 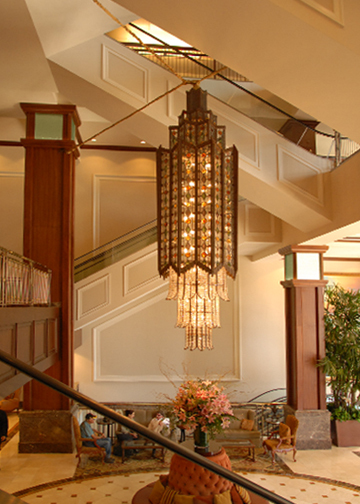 A 12′ x 10′ outdoor crystal chandelier replicating a design dating back to the mid 18th century hangs above the open-style trolley and a brilliantly crafted chandelier echoing the Art Deco period stands at an impressive 17 feet tall, exuding elegance in the grand lobby lounge. 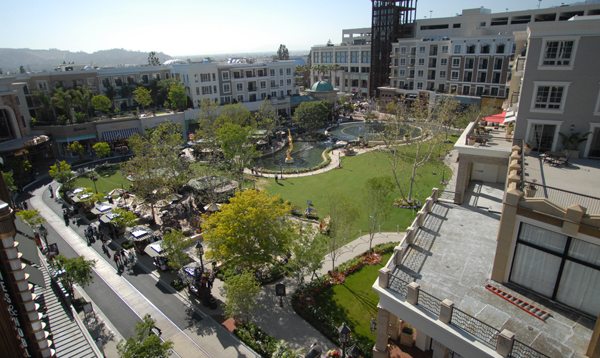 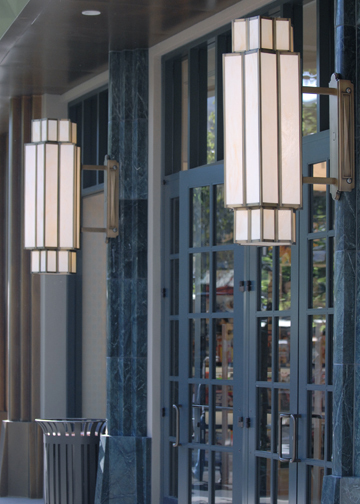 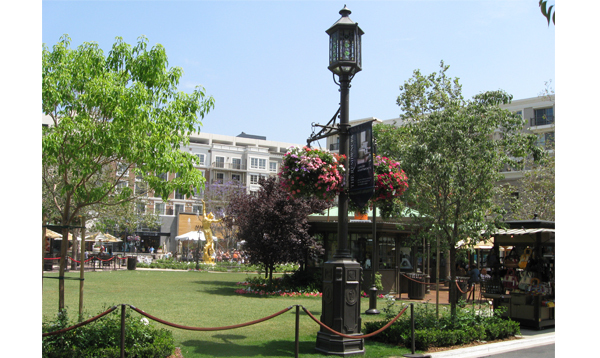 For the pedestrian and outdoor leisure areas, ELA produced a custom stained glass lantern, arm, and pole assembly along with five uniquely crafted wall mount units to softly illuminate the landscape while complimenting the architectural environment. 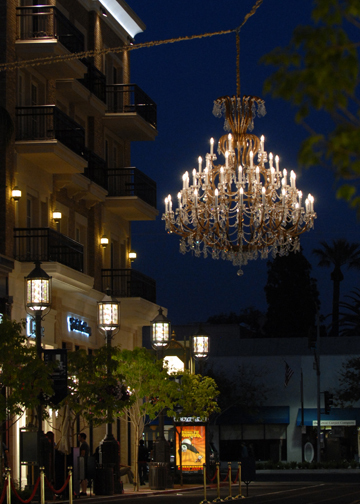 Cyrstal Chandelier: A spectacular masterpiece of illumination, shimmering with 1,200 sparkling crystals and 55 lights, the Grand Chandelier is suspended above Caruso Avenue by a single chain at its center and stabilized with a wire cabling system connected to the buildings on either side of the street. 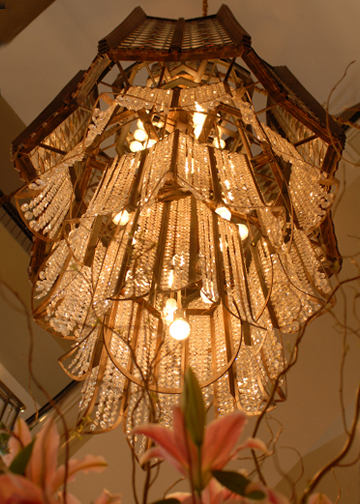 Designed by world-renowned historic lighting designer Ernesto Aleman, whose inspiration came from a magnificent chandelier created for Austrian empress Maria Theresa in the 18th century, it was meticulously handcrafted by ELA and took 2 months from concept to completion. 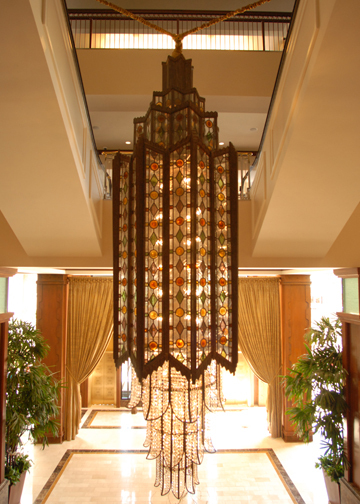 The 12-foot-high frame is fabricated from elegantly curved aluminum. 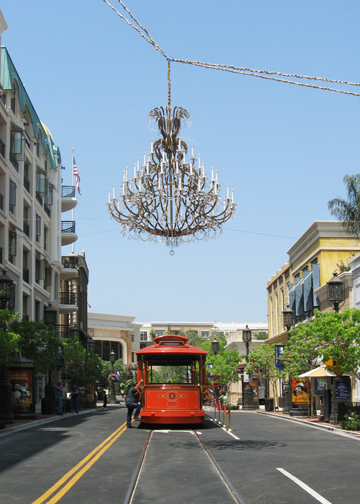 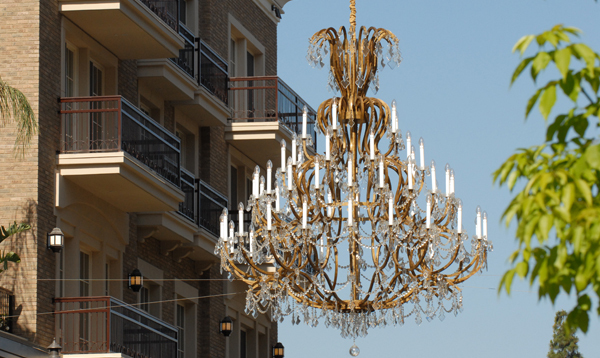 Ten feet in diameter and weighting 600 pounds, The Grand Chandelier features brilliant etched, flat pendalogue and almond drop crystals from the Czech Republic - a leading producer of the world's finest quality crystal.- The Americana at Brand Tribute Book. 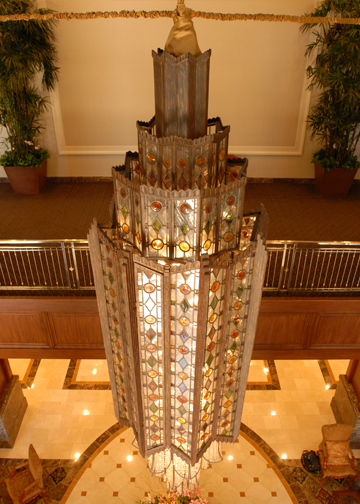 Product materials: Aluminum, Brass, Leaded Stained Glass, Seeded Glass, Clear Glass, Crystal. 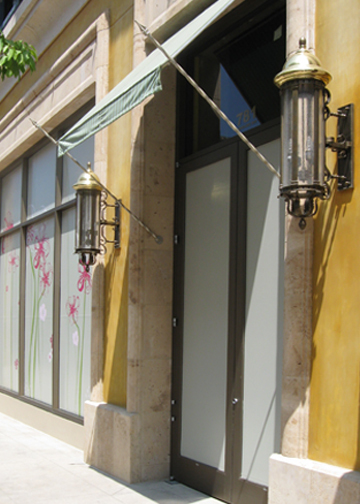 Finishes: Standard powder coat and hand-applied colors. 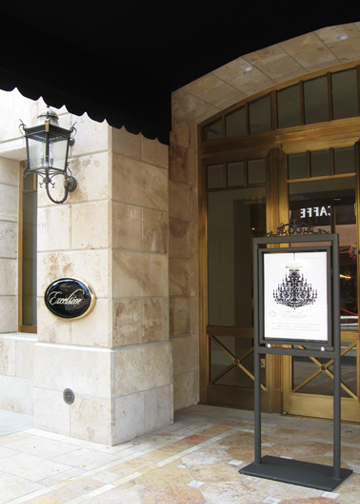 Special thank you to ELA's Design and Engineer team: Ernesto Aleman, Larry DeSoto, Greg Aguilar and Marie Preciado. 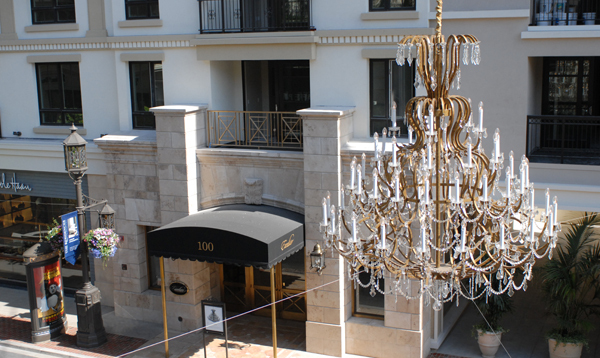 To learn more about ELA's Custom Division and capabilities click here. 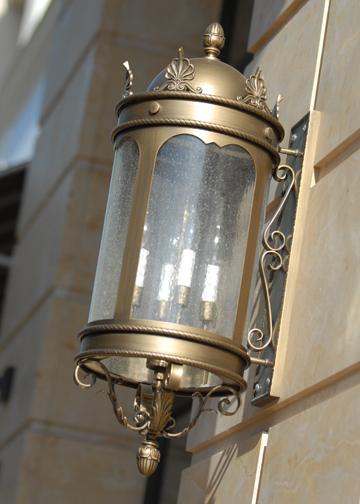 contact Scott Jones at scott@ela-lighting.com.